RAM review is a tricky subject, since almost all the time more Memory will help you than faster memory. Sure faster memory kits have their place when you have your PC all decked out in the fastest hardware. But usually faster RAM will take lower precedence than say more RAM, or SSD or more storage space. 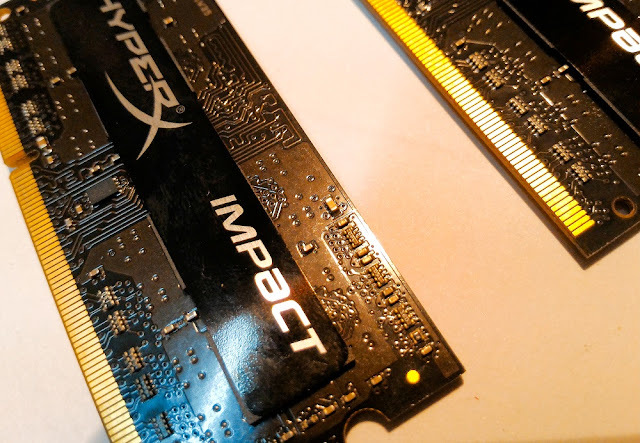 I wasn't really a proponent of faster RAM kits before I used the kit I am reviewing today, which is Kingston HyperX Impact, which is a SODIMM RAM, i.e. 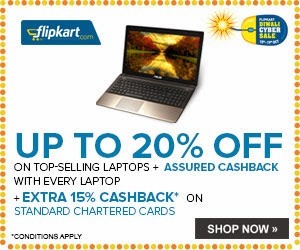 for laptops. So this fact itself puts this 4x2GB kit in rare company as we don't really see faster/off-market RAMs for laptops, every DDR3 laptop comes with a 1333Mhz kit, and this kit is 1866Mhz so this should really be something to look forward to as a user and reviewer. So without wasting any more words, let's get on with it. The kit comes in a standard RAM package and there is nothing special about it other than the Black color chip, which usually green is normal RAM kits. 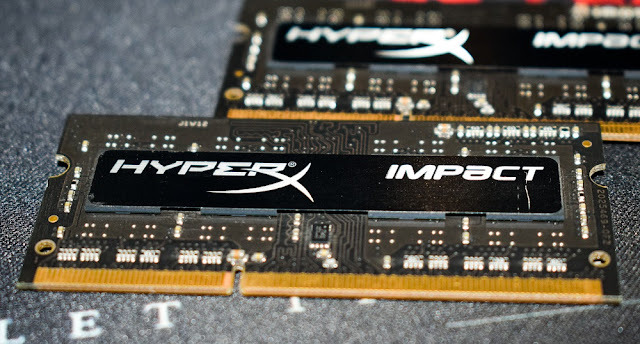 On the front you have the HyperX Impact label, and on the back model number and other details, it also indicates that this kit runs on 1.35V, which is higher than what standard kits will run at which is 1.2V. Oh and you also get a HyperX sticker to slap on your laptop if you are into that kind of things. There is no heatsink or anything of that sort to dissipate extra heat as desktop high frequency kits come with but that is not possible on SODIMM since there is not space inside a laptop for that. Since this is a RAM kit, there is no other option to test this vs normal kit in perceptive way other than doing Synthetic benchmarks and that is what we will do. I didn't post other details because they aren't going to be any factor in the Synthetic bandwidth tests we will be doing and looking at. When it comes to Benchmarks for RAM kits, Sisoft Sandra is the on utility that does it all but I will also be using AIDA64 to corroborate results. The red result on the above graph represents the kit we are reviewing and the other boxes refer to other online results properly validated by Sandra, Yellow item on graph is a 1333Mhz kit, and the others are 1866Mhz kit, as you can see this is the kit with the most Memory bandwidth speed in GB/s. There is one more factor that affects how fast and responsive a RAM can be, that other factor is RAM timings, the faster and tighter the timings, the faster response time and latency a RAM will have. This ram has timings of 10-10-10-32-1T, 1T here refers to command rate of a RAM, lower the command rate, the better is the performance, There are RAM kits that also come with 2T, so they will obviously be on the slower side. The results I got here are exactly the same as Sisoft Sandra but here they are anyway. One interesting feature in AIDA64 suite is you can test the RAM latency and compare it to results online and it may not be much but the latency of this kit was 59ns, and when compared to other 1333Mhz kits, they had latencies upwards of 67ns. There isn't much to conclude from this Review other than that faster RAM will help you in making your PC just that little bit faster, but In my experience, investing in more RAM may be more beneficial in long term as compared to faster RAM or kits with low latency. But other than that, if you are going to be running some Blockchain processes right off the RAM or going to saturate your Gigabit line with RAMdisk using your faster RAM then these HyperX Impact SODIMM kits are right up your alley, also if you are a resular user who likes that extra speed to their system and isn't wary to put some money to get faster RAM to see that happen, these are the RAM kits for you. Kingston maybe the only manufacturer right now with fast speed Laptop RAMs, so they are doing something right by keeping this side of the market in their hands.